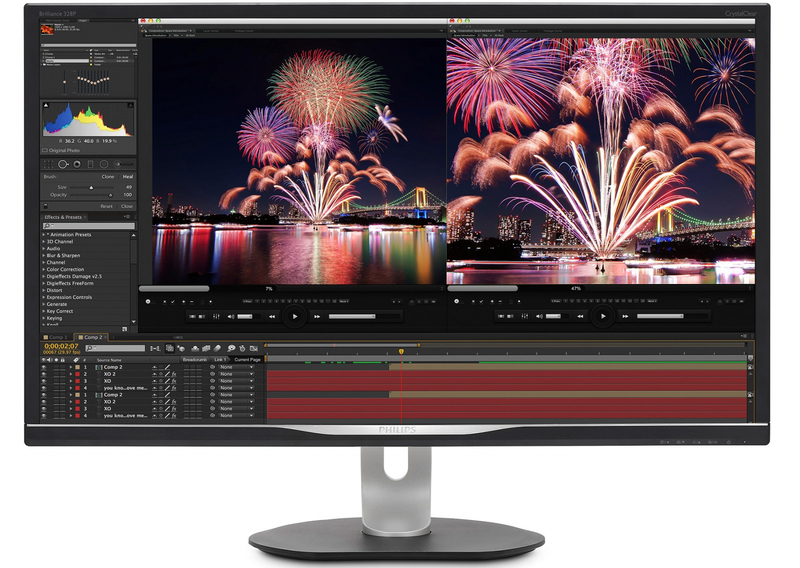 Looking for a professional monitor with a slew of connectivity options and features? Then you might want to check out Philips’ upcoming offerings. The Dutch firm chose the recent IFA event to announce two new displays, both of which come with USB Type-C inputs, Gigabit Ethernet ports, and wide color gamuts. The first of these 31.5-inch LCD monitors is the Philips 328P6AU. This is the less feature-packed of the two, and as such will likely come in at a lower price. That’s not to say it isn’t impressive, though. It features an IPS-ADS panel, a 2560 x 1440 resolution, and provides a maximum 400 nits of brightness. There’s no word on refresh rate, but 60 Hz seems likely. Philips says the 328P6AU covers 98 percent of the AdobeRGB color space and, being aimed at professionals, its stand allows for height, rotation, pivot, and tilt adjustments. It can also be set to a portrait mode. The other monitor — the Philips 328P6VU (pictured) — boasts more advanced specs. It comes with an IPS-AAS panel, with a resolution boosted to UHD 4K (3840 x 2160). The maximum brightness is also increased up to 600 nits, and Philips says it covers 95 percent of the NTSC color space. Another difference between the two monitors is that the 328P6VU comes with backlighting that supports 16-zone local dimming, which should allow high contrast ratios and save on power. The refresh rate of this display is again thought to be 60 Hz. Both monitors feature DisplayPort, HDMI, and D-Sub (VGA) inputs, as well as USB Type-C ports, the latter of which can be used as a display input and as an upstream port for a hub featuring USB 3.0 ports and a Gigabit Ethernet connector, according to Anandtech. They also have integrated 3 W stereo speakers, and Philips says HDR is “supported,” though most HDR LCD screens feature a maximum 1000 nits of brightness or above. Pricing for the Philips 328P6AU has yet to be revealed, but we do know the monitor will arrive next month. The more high-end 328P6VU will launch in the first quarter of next year and cost around 529 - 549 Euros ($632 - $655).